Teddy Wares and Flutterbies: WOYWW 259 - Ever Closer! WOYWW 259 - Ever Closer! I'm seriously thinking of removing the Christmas Countdown at the top of my blog. What with that, and WOYWW Week 260 racing towards us, I feel my life is just running away! Reuben is happy with his new waistcoat, although his Mum couldn't get him to do it up! I worried it was a bit too small, but she assures me it's fine and will send a pic with it buttoned, and him in his bow tie, too - can't wait! I've now started a short sleeved cardi for his big sister, Maisie (4). 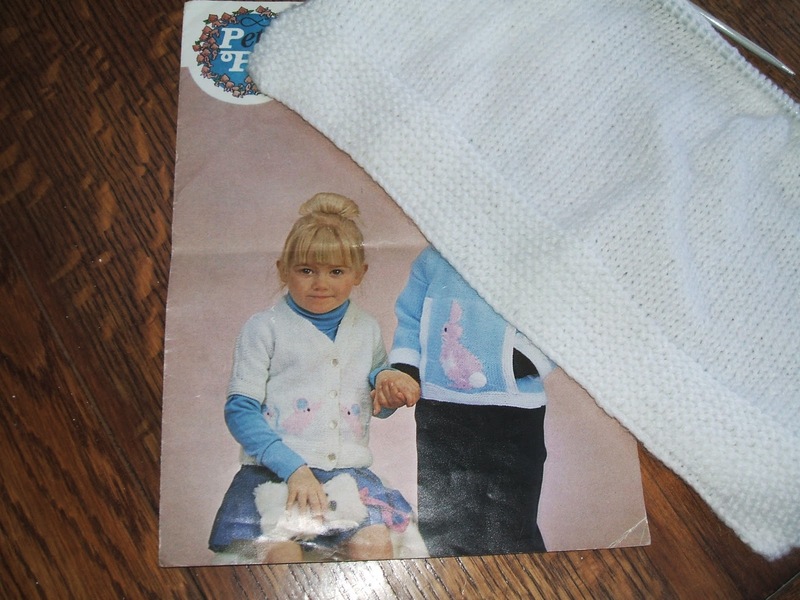 It's not very clear, but there are pink/blue mice on the fronts, so I hope she'll like it. I'm very pleased with the results of the £1.50 lamp makeover at the weekend. This is how it looked before. And this is it afterwards. 3. Cut motifs from paper napkin. Remove backing layer(s). 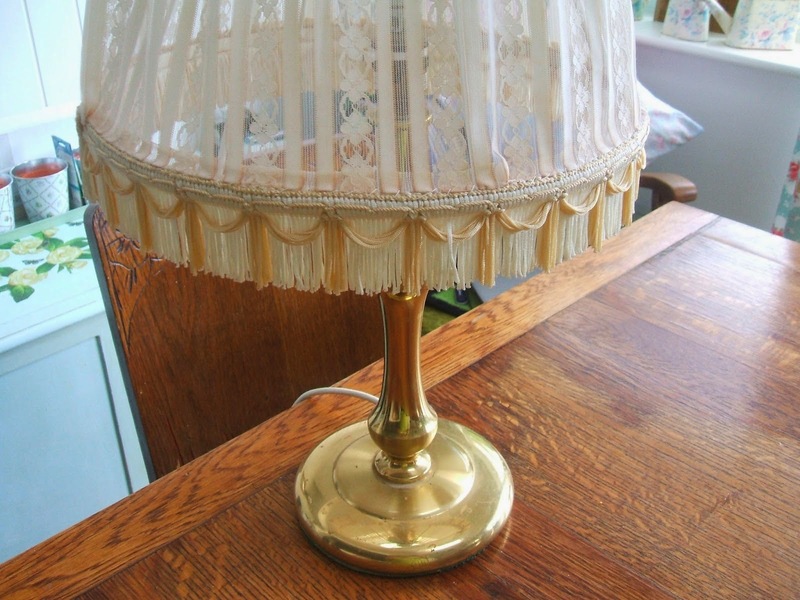 Brush PVA onto lamp (do not glue motifs - tissue tears too easily). Position motifs and allow to dry. 4. 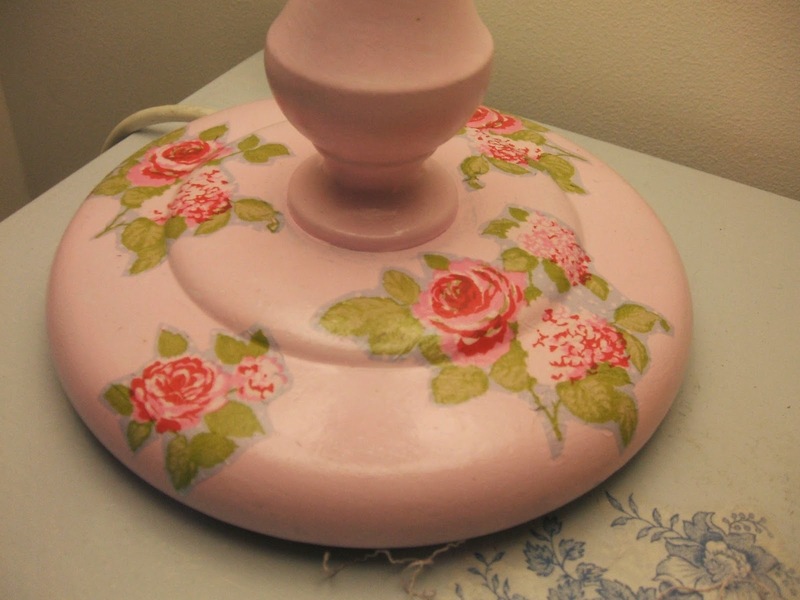 Paint whole lamp with PVA (dries clear with slight sheen) to seal paint and motifs. 5. Turn on lamp and enjoy! I use this technique for most of my upcycling now - quick, easy and effective - what more could you ask for?! I didn't intend making another new shade, but the cream one clashed horribly with the pink, so I made a tube of fabric and threaded elastic at the top and bottom, for easy removal and washing. Now, I need to get back to ATC making - see you over at Julia's for a virtual cuppa. Wondering what I'm talking about? Just click on the WOYWW button on my side bar. Cute waistcoat for Reuben, and that lamp turned out really well didn't it? I used to feel life was galloping away from me, but when I was having sinus troubles, I started using relaxation cd's and now relax and use the cd's every day.It is lovely and makes me feel gloriously calm, and as refreshed as if I had been sleeping.I do my relax'n late afternoon,I spend between 1/2- 3/4 hr per day. My own special time. Wow.. a lovely up cycled lamp! I would never have thought of doing that, clever you it looks great. Reuben looks pretty smart too! The lamp make over is great & what a transformation . Lovely it . Oh wow. I didn't realize you were going to change the lampshade, too. Now it is truly coordinated. Looks like the handsome young man will be ready for the big day, too. Happy WOYWW from #2. Gorgeous waistcoat and great makeover on the lamp. Oh bless Reuben, we made him shy! 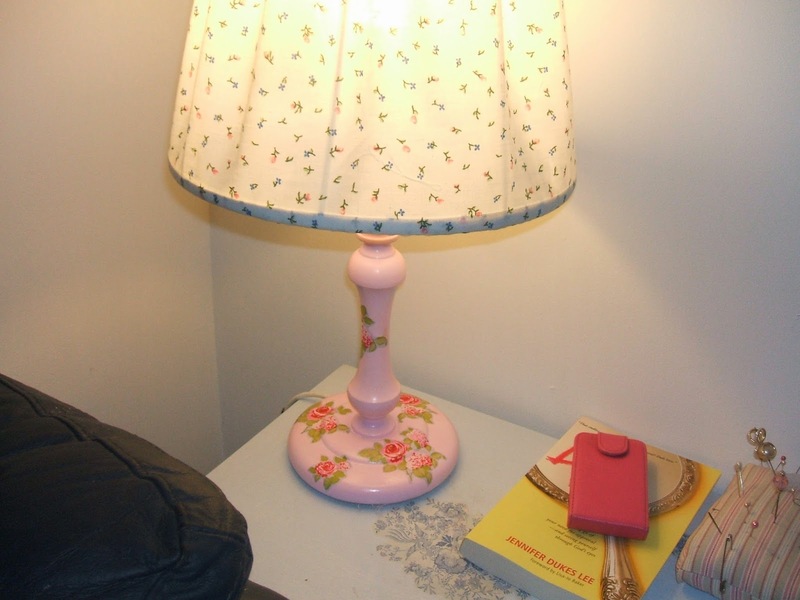 Clever lampshade makeover - the elastic top and bottom is a fab idea! Love your lamp make over, you are so clever. Reuben is one dapper little chap and look at that snow white hair, my son was like that a very long time ago. Hope you have a wonderful week. The lamp has turned out beautifully, what a great makeover! Happy near 5 year WOYWW! A lot going on in your world, too, Chris! Love the knitting, and I think the little lad is quite right - the waistcoat undone is way cooler than done up lol! As for your lamp, it is stunning. What a transformation. I use gel medium for laying down stuff in the same way you used the PVA, and adding the sealing layer on top really helps make the decoupage become part of the object. It's really beautiful. Thanks for your lovely comment, and I'm glad you like what's going on in my creative world at the moment. Thanks for your good wishes for my hubby's retirement. I don't think my life will change at all - I will still have to do all the things I've always done (no retirement for wives lol!) - the only difference is that if he's around at all, he'll be under my feet. Hopefully he'll now have time to take me out so I can trawl round markets etc. and pick up some bargains for my mixed media art! Gorgeous lamp and so is Reuben. I'm only just doing my rounds to catch up with all my blogging friends....it's been a busy day with lots of extra cuddles needed by my little poorly munchkins. 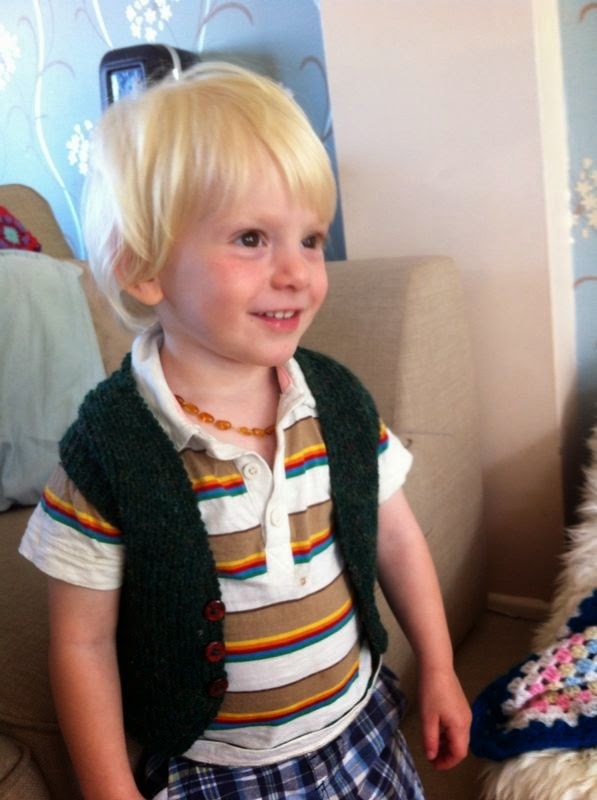 Love your little model in his waistcoat :-) Look forward to seeing the next knitting project completed too. I'm really looking forward to swapping ATCs next week. The waistcoat just looks fab on Reuben! And the cardigan looks just too cute! Your lamp turned out wonderful. I was having trouble imagining it when you showed it last week. Thanks for popping by and Happy WOYWW! Rueben looks quite dapper with his new waistcoat, and that lamp update came out wonderful. Blessings! How very pretty your lamp turned out. Love the romantic twist to it. Yes, Master Rueben looks spiffy in his new waistcoat.....such a cutie! Reuben looks good in the waistcoat. I'm sure Maisie will love the mice cardi. The lamp is really fab. Hope you can get caught up with your crafty stuff. Chris I love that lamp, very pretty. I never seem to be able to buy the right kind of stuff to upcycle like that. The grandson looks good in his waistcoat too. Thanks for your visit and lovely comments. Oooooo LOVE that lamp, nice job! Looking forward to swapping! Thanks for the visit and the kind comment. Well done, Chris - the waistcoat is great. Of course, the smashing looking young man modelling it just adds to the glam!! That lamp is lovely - well done again! Thanks for visiting - yes, frazzled is a good word. One step forward and two back is a long haul!!! So you decided to pain the lamp after all! It came out so cute! And thanks for posting a pic of Reuben in his waistcoat! How completely adorable. The sweater for his sister is so cute too!! You're so talented! thanks for your visit earlier - so excited as this will be my first crop!!! That lamp has the WOW! factor, soooo beautiful. Well done you! Goodness, you are so clever, love how you've transformed that light, it looks so pretty now and really expensive. Thanks for stopping by earlier and sorry for the late visit.